Cheap return flights from Barcelona to Uruguay from €455! Cheap return flights from Spain to Windhoek, Namibia from €391! Cheap return flights from Barcelona to Uruguay from €455 with Oneworld member LATAM Group Airlines! Except the deal from France (see our link below) there is one more good option from Europe to this South American country during current LATAM promo sale..Note that fare is for a roundtrip ticket and inclusive of all taxes, meals and hand bag. There is no checked bag in base fare only available for extra fee. To book the cheapest tariff available you would have to accept long layover in Sao Paulo on your inbound.. If interested in this offer please look for flights departing from Barcelona to Montevideo from 20th of March to 9th of April or 1st to 30th of May. Based on date of your outbound flight from Spain to Uruguay. LATAM promo tariff is valid till 31st of March. 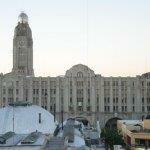 You can book some affordable accommodation in Montevideo via Booking.com. Or you can use this valid Hotels.com promotion code. Travel dates. : We recommend to firstly compare the cheapest flights via Google Flights. The tool gives you almost instant result and you can easily browse throughout all the months. You can then book this deal directly with LATAM Airlines Group or your preferred booking agent. Booking sample of cheap return flights from Barcelona to Uruguay from €455! Also as per link to this deal your outbound date from Spain to Montevideo would be on Monday, 6th of May. Inbound from South America back to Spain on 21st of May 2019.